These chunky flow sticks are great fun, and are handy for so many different events! Just snap them and glow the night away! They have little hooks on the top, so would look stunning around the garden on some ribbon, or hanging in the tent, great for Halloween and Guy Fawkes - dare to be different! Perfect for: Parties, concerts, camping, hen/stag nights, fund raising events and special occasions. 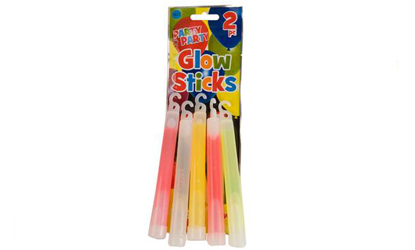 Each pack contains 2 glow sticks.